It has been a long time since we made a post here and this probably will serve as the final post on the current website. This post is to tell you about some important changes we are making largely in reaction to a new European law called GDPR that has came into effect (we will get to that). More importantly Nitrome has changed a lot in the last few years as we have shifted our focus from browser games to mobile and now also PC and console (I hope you guys saw that Bomb Chicken was coming to Nintendo Switch). It was about time we changed the website to reflect that and so the upshot is that there is a new more modern site in development (we will get to that too). Well in a nutshell it’s a law to help protect European citizens from companies keeping and using data collected about a user without their consent. 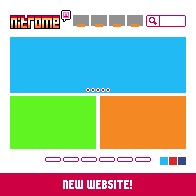 Though it’s aimed at Europeans it is not a requirement that they live in Europe, so in effect any site that has a global audience (like Nitrome.com) needs to react to this change. How does it affect Nitrome.com? The big and regretful change you probably already noticed is that accounts are no longer a thing. This includes all of your collected avatars, your friend’s lists and comments. The accounts sadly used information that we could not realistically and retrospectively get permissions for and to keep them active or even keep storing them would mean leaving Nitrome open to a law suit. It may seem drastic, but the effects of such a suit if it were ever brought would likely collapse Nitrome overnight so this was clearly the lesser evil. To be clear we had to do this and there is no way back. We will never be able to bring peoples accounts back because they have been intentionally deleted so please don’t ask. So with the bad news out of the way we can move towards the more positive news of a brand new site! We started making it a few weeks back when the extent of GDPR became apparent and it is now well underway. It is modern and should finally work as great on your mobile device as it does your desktop. Speaking of mobile, the site is more aimed towards the games we make now so it is less of a browser games portal than it was in the past. As part of this it is mostly ad free with the exception of pages you can play games in the browser on. There will not be an accounts system on the new site, although we may consider making one later. With regards to the browser games, they will still be there! We are fully aware of the increasingly diminished support for Flash games in browsers and its impending shutdown in a couple of year’s time. We also however don’t like the idea of killing games we poured countless hours into making and wiping them from existence. So there is still going to be a dedicated area of the site to access them for as long as Flash games are viable. In addition we have brought a couple of the games to mobile now and we have more on the way. We intend to keep looking at ways we can keep as much of our back catalogue alive as is financially viable to do so going forward. Anyone who is interested in seeing all the latest news on our upcoming games or new site should follow us on our twitter account (this is where we are our most active). We are very excited about what is in store for Nitrome in the future and we hope as many of you as possible will continue to support our team on our crazy game making adventure.